Blues InterchangeMarcus Davies and is possibly out for the game. Blues InterchangeMarcus Davies off due to an injury. 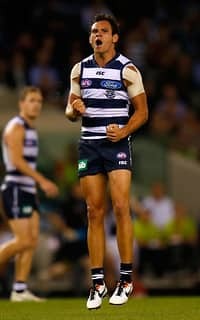 Cats InterchangeAndrew Mackie off due to an injury. GOAL CATSMotlop with the precise kick inside 50 finds Hunt, he lines up 30 out right on the boundary line, it's a brilliant kick as he curls the kick around & sends it straight over the ump's head! GOAL CATSJohnson is brave in the marking contest after receiving a heavy knock, the ball spills free for Podsiadly & from just 20 out he goes BANG! Varcoe has come from the field after receiving a heavy knock to the shoulder, he has gone straight to the rooms. GOAL CATSBartel with the handball over the top to Christensen, he runs to 48 & unloads with a floating kick & threads it through! GOAL BLUESRowe finds space & takes the grab, he lines up 40 out directly in front & he threads it through the middle, the Blues lead by 16 points! Geelong have had 11 inside 50s to Carlton's 8, yet the Cats trail by 10 points. 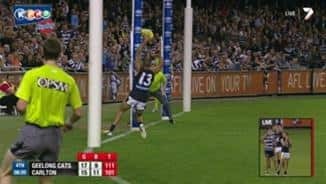 BEHIND BLUESMotlop receives a free after being held in the marking contest, he unloads from right on 50 on a slight angle, the kick starts left & it stays left. GOAL BLUESThe ball is bounced in Carlton's forward pocket, it comes out to McLean who hurriedly plays on, he snaps from 30 & threads through Carlton's 3rd, they lead by 11 points! BEHIND BLUESGarlett has space & takes the grab 55 out, he plays on & unloads from right on 50 but his kick also falls short & goes through for a rushed behind. BEHIND BLUESJamieson receives the handball & runs inside 50, he unloads & the kick just falls short & it comes off the pack for a minor score. BEHIND CATSGeelong run it out of defence & work it into their attacking zone, Johnson with the snap but his kick is offline. BEHIND BLUESTuohy unloads with a driving kick from 50 however he just misses to the right. 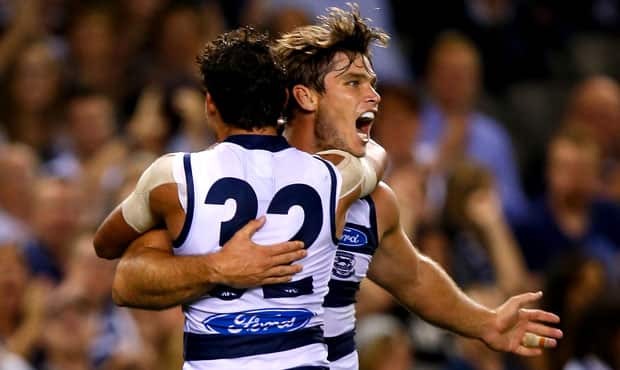 GOAL CATSGeelong get the quick reply as they work the ball forward, West takes the strong grab, he lines up just inside 50 on a tight angle & splits the middle! The Blues lead by 9 points, they have scored 2 goals in a minute and did so against the flow of play. GOAL BLUESCarlton win the ball out of the middle, Lucas receives the handball & unloads from outside 50, the ball bounces in the goal square, he gets a good bounce & it bounces through! GOAL BLUESThe ball is thrown in, Scotland takes possession from the throw in, has a snap from 30 out & threads it through for the Blues against the flow of play. Judd takes possession, he has a bounce & unloads from just inside 50 but his kick is offline & goes out of bounds for a throw in. BEHIND CATSA nice low kick by Chapman inside 50 & Hawkins takes the strong grab out in front, he lines up 45 out on a 45 degree angle but the kick goes from right to left & through for a behind. The Blues are struggling to get clean possession of the ball, their disposal has been very sloppy thus far. It's been a very cautious and slow start to the match by both teams. BEHIND CATSLonergan sends the ball to the top of the goal square, it comes off the pack & goes through for a behind. BEHIND CATSAn early opportunity for the Cats as Motlop wins possession 35 out, he has a snap but his kick is away to the left for a minor score. The siren sounds, the umpire goes BANG & we're underwaythe Cats win the ball out of the middle. Welcome to Etihad Stadium where the undefeated Geelong host the winless Carlton, we are set for a cracking match! Welcome to Etihad Stadium for the Geelong Cats v Carlton Round 3 clash. 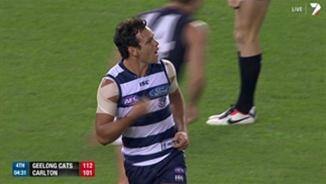 CARLTON remains winless in 2013 after suffering a 16-point loss to Geelong at Etihad Stadium on Saturday night. It's the first time a Mick Malthouse-coached side has lost the first three games of a season since he led Footscray in 1987. The Blues were dismantled in the third quarter and despite challenging in the last, fell short, going down 18.11 (119) to 15.13 (103). "I think good sides last longer. 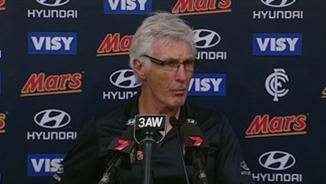 They're a very good football side," Malthouse conceded. "The three sides we've played have given us some food for thought. I'm not disappointed in the attitude or the effort. I think what we let ourselves down in is in five-to-seven minutes a quarter or half. "That's what happened. The pattern has been over three games, we've just allowed the opposition to take a firm hold of those vital minutes. "We'll get better because of it." Further souring the occasion, the Blues lost Matthew Kreuzer in the first quarter with a broken thumb. He was sent to hospital, and will miss up to eight weeks. The Cats suffered casualties too, forced to make an early substitution when they lost Travis Varcoe to a shoulder injury. He could miss 12 weeks if surgery is required. 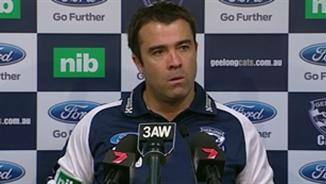 "It doesn't look good," Geelong coach Chris Scott said of the injury. Forward Steve Johnson received a knock to his right knee, but fought on to play out the game. After trailing by as much as 16 points in the first term, the Cats stormed home with four goals in a row to lead by eight at quarter-time. 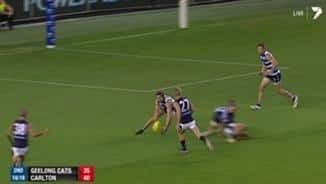 Carlton responded after the change, with four unanswered goals to open up a 17-point lead, but the Cats found another gear yet again, kicking seven of the last eight goals to regain control. "We have a degree of confidence that when the game is on the line our guys would step up, but it would be foolhardy to expect we can do that every time against good opposition, which Carlton are," Scott said. "We feel a little relieved they missed some of the shots they did." In a crucial tagging job, Taylor Hunt shut down Marc Murphy in the first half, keeping him to 12 possessions. Hunt collected 10 touches, five tackles and three goals in the first half. Andrew Walker cruised the back half, racking up 20 touches by the main change to lead the possession count. Walker was prolific for Carlton with a game-high 33 disposals while Andrew Carrazzo played a fine negating role on Cats skipper Joel Selwood. 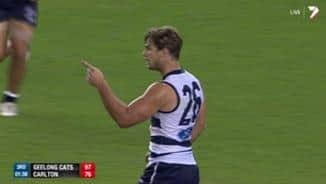 Selwood could come under scrutiny from the Match Review Panel for slapping Zach Tuohy just before half-time, which resulted in a push and shove at the mainbreak. The Cats were able to build a lead in the third quarter, but in the fourth, it was nailbiting. The Blues fought back with the first four goals of the term, reducing the lead to just 10 points. 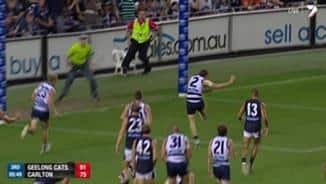 The Cats looked set to steady when Jimmy Bartel found Steve Johnson on a lead, but the ball was brought back after a streaker invaded the ground. A Steven Motlop long bomb capped a strong performance and gave the Cats some breathing space before they holding on in the dying stages. Mathew Stokes starred for the Cats with 30 touches and a goal, while Taylor Hunt and Tom Hawkins each kicked three majors. Carlton is still yet to beat Geelong at Etihad Stadium.